As a tech writer, I'm often asked by people whether they should buy an iPhone 4 or wait for the inevitable iPhone 5. That's a hard question to answer when you don't know exactly what's coming, or when. A couple of leaks -- one from Digitimes and one from China Times -- suggest that the iPhone 5 will have a 4-inch display, compared to 3.5 inches on the iPhone 4, but the phone itself might not get much bigger. Instead, Apple may reduce the bezel around the phone and dedicate more surface area to the screen. Citing a source at Foxconn, which manufactures many Apple products, 9 to 5 Mac reports that the iPhone 5 may look like its predecessor, but will have an aluminum back, kind of like the original iPhone. Another report from Japanese blog Mac Otakara also suggests an aluminum case, along with a redesigned antenna to prevent another signal attenuation scandal. 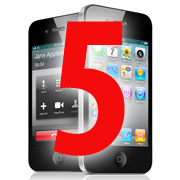 Product codes hidden within iOS 4.3 suggest that Apple will bring its dual-core A5 processor, which debuted in the iPad 2, to the iPhone 5. A fresh report from 9 to 5 Mac states that Apple is lending prototype devices to developers, containing the dual-core chip. Given that the original iPad and iPhone 4 use the same A4 processor, the next iPhone seems likely to follow in the iPad 2's footsteps. Near-field communication in the iPhone 5 is the geek equivalent of the Ross-Rachael drama. Yes, the iPhone 5 will support mobile payments through NFC. Or it won't. Or it will. It's anybody's guess at this point. iFixit's teardown of the Verizon iPhone 4 revealed a unique chip from Qualcomm that supports GSM and CDMA wireless networks, but lacks the SIM card slot and antenna necessary for overseas use. Verizon Chief Financial Officer Fran Shammo said in a recent earnings call said the next Verizon iPhone will be a global device, so perhaps Apple is making the necessary adjustments for a dual-mode iPhone 5. For the last few years, Apple has launched a new iPhone over the summer, but the iPhone 5 could break tradition with a September launch, or maybe even next year. Apple's Worldwide Developers Conference, where the company has announced the iPhone in the past, may only be dedicated to software this time around.